Water scarcity in the Middle East has long been an issue due to the area’s desert climate and lack of freshwater resources. While water access is a humanitarian issue, in this region it also carries enormous political importance. Despite efforts in previous peace negotiations to bring water security, more technical, institutional and political cooperation is needed. A new World Bank initiative aims to help spur this type of cooperation, with Israel at the helm. Israel is internationally recognized for its ability to manage and deliver scarce water resources. Israel has built four desalination plants since 2005, and five more are expected to begin operations soon. Additionally, cooperation agreements with Jordan have improved the region’s water distribution infrastructure. Through desalinization of Mediterranean and Red Sea water (which accounts for 80% of Israel’s total water today), Israel has reached water stability. 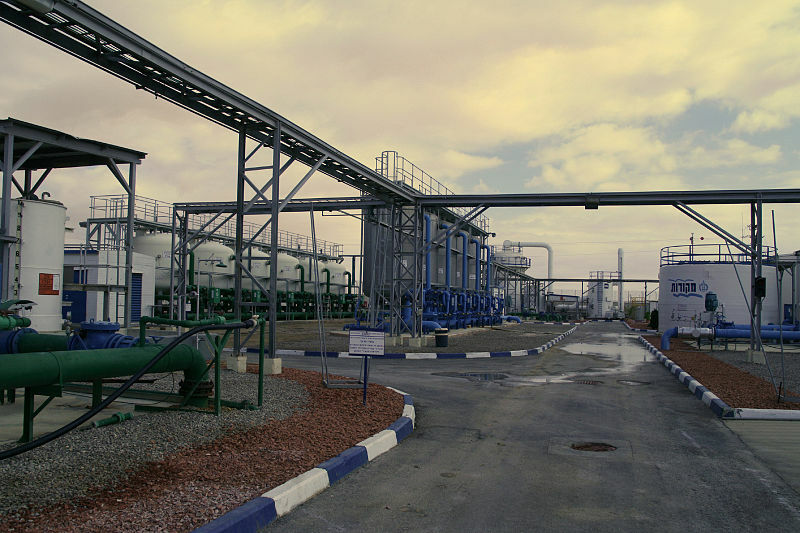 Nitzana Desalinization Plant in Israel courtesy of Wikimedia Commons. On June 17 Israel’s Ministry of Economy signed a $500,000 agreement with the World Bank to promote knowledge sharing on water issues through technical assistance, capacity building, and knowledge dissemination. Every World Bank Group member country aiming to improve its water resilience is eligible to participate; countries facing water stress are highly encouraged to take part. In order to share its technological and institutional improvements in water security, predominantly in distribution and management, Israel will host infrastructure tours supported by the World Bank. This project follows others led by the World Banks’ Water Global Practice Group that have extended water access to over 36.7 million people between 2011 and 2014. This kind of knowledge sharing agreement has no precedent in the region. However, some projects to alleviate water scarcity have been implemented in the past. In 2013, the Palestinian Authority, Jordan, and Israel signed a contract to build a water project between the Red Sea and the Dead Sea. In this agreement, Israel promised to provide between 8 and 13 billion gallons of fresh water per year to Jordan and to open the sale of up to eight billion gallons to the Palestinian Authority at preferential rates. While the agreement came to fruition, it only served to provide a short-term solution rather than addressing key issues to achieve sustainable water security. While political tensions in the region might threaten knowledge-sharing initiatives, the World Bank is actively trying to circumvent these while recognizing Israel’s strategic interests. In an interview I conducted with World Bank Communications Officer Nansia Constantinou, she noted that there are no conditions for recipient countries. However, this initiative will also help Israel solidify its role as a key player in water stability regionally and globally. In addition to political concerns, financial feasibility is a large barrier most countries face when attempting to achieve water security; many countries in the region do not have Israel’s financial means to invest in water. A desalination plant can cost from $300 to $450 million, and such large fixed investments are a burden on national budgets. Multilateral agreements and public-private partnerships (PPPs) can help coordinate the construction and later management of the projects. This is the case for the World Bank-financed desalinization plant in the Gulf of Aqaba, Jordan and the national plants distributed along the coastline of Israel. IDE Technologies develops projects and manages facilities to finally make direct deals with the Israel Water Authority. A PPP like this could improve water security in many places since the financial burden of investing would be shared. Water security is important both for the Middle East’s geopolitical stability and meeting residents’ basic needs. To provide water for the region’s people, initiatives like the World Bank’s new agreement with Israel and PPPs for water management require more local and international support. However, the political ramifications of these types of initiatives cannot be ignored and should be presented forthrightly. Miguel E. Eusse Bencardino is a researcher with the Project on Prosperity and Development at CSIS. ← How Can Tunisia Stop Tax Evasion?